One of the toughest parts about driving, besides finding a good way to dip your drive-thru chicken nuggets, is dealing with countless unexpected hazards without freaking out. You're supposed to keep it together even when random jerks dart in front of you or stop short on the highway, and when weird animals come out of nowhere. However, no amount of driver's ed can prepare you for the mid-drive surprise one man encountered recently, when a huge venomous snake poked its head out his car's hood and started slithering up his windshield. On Tuesday, a man driving in an area north of Brisbane, Australia was minding his business on the road, when suddenly, a big ol' snake popped its head out from under his hood and started crawling up toward the top of the vehicle. It being Australia, a continent filled with deadly creatures, the driver seemed to recognize it right away as a venomous Eastern Brown snake. It's unclear whether or not he screeched in fear (and really, who could blame him), but he promptly pulled over to address the situation. And by address the situation, we mean to say he notified someone known as The Snake Catcher, who then rushed to the scene to handle things. Fortunately, the whole scene was under control shortly thereafter. 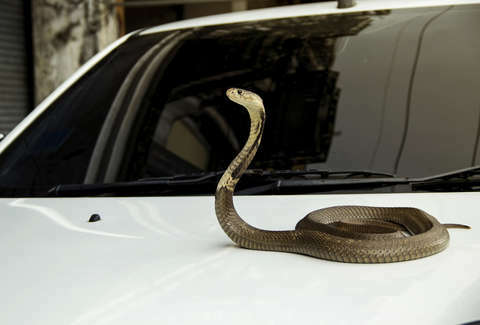 And while there's no question a rogue snake slithering out from the hood is terrifying, it sure beats a giant spider lurking on your sun visor.